I was reading a fairly old book of collected essays on Upper Canada the other night. It was the 1975 edition of Historical Essays on Upper Canada edited by J. K. Johnson. There has been a second collection of essays released in 1989, again edited by J. K. Johnson but joined by Bruce Wilson this time. Now actually that he mentions it, I had noticed that much of the history I’ve read of Upper Canada has a strong economic history focus. I don’t really think that Australian history has the same emphasis. There’s Shann’s old Economic History of Australia written in 1948, and the Butlins whom I’ve written about here who also write economic histories. Blainey’s work, especially The Tyranny of Distance makes an argument with strong economic strands, but it doesn’t have the tables and figures that mark so much of the Upper Canadian material I have read (which is, to be fair, often chapters and articles). Nonetheless I’d be hard pressed to think of a recent general book about Australian history that has a really strong economic focus. Johnson’s justification for the emphasis on economic history among Ontarian historians would hold just as true for Port Phillip which was likewise established by people wanting to make money. But again, I don’t think that this is the case. A.G.L. Shaw’s A History of the Port Phillip District is a narrative history that includes a strong economic analysis, but it is just one strand among several. Likewise the three volume Priestley/Broome/Dingle series published for Victoria’s 150th anniversary- the economic story is there, running steadily underneath, but not the main focus. I can really only think of one academic on staff whom I would characterize as an “economic historian” and only one of my fellow postgraduates has written an overtly economic thesis. Several of my colleagues are writing environmental histories, but they are of a different hue. I’m aware that historical specialisations wax and wane, and that some institutions attract particular schools of historians. But I’m wondering if there’s some cultural influence at play here too- a variation of the ‘tall poppy syndrome’ perhaps? As an Australian, I live on an island continent. But in a land where the horizon stretches as far as the eye can see across plains and mountains, it’s hard to remember that it is actually an island. It’s only when you see our continent suspended in all that ocean on a map that you have a sense of its ‘girtness’ by the surrounding sea. In fact, at the risk of sounding mawkish, I often feel a throb of love when I see Australia on a world map, so complete and self-contained. I’ve been thinking about islands a lot while up at Norfolk Island last week. It’s only small- 36 square kilometres- and has no safe harbour. You can easily drive from one side of the island to the other and all around you is water, stretching on forever. I found it to be breathtakingly beautiful and I wondered if even convicts sometimes looked up to the sky, or out to the ocean on a calm day and found any beauty in it at all. Islands have long been used as places of exile, both in the past and today: St Helena, Robben Island, Christmas Island and Norfolk Island itself. Of course the coastline and expanse of water provides its own form of imprisonment, but I think that there’s another aspect of exile at play. For our own Christmas Island , there has been the ugly term “excision” to describe the deliberate, surgical cutting out of the island and beaches from the nation as a body, to ensure that anyone who lands there can have no access to the courts. I think about Norfolk Island in the Second settlement phase and the absolute power of the Commandants who could choose to use or abuse it, and the tenuousness of the links to British Justice. Justices Dowling and Burton visited the island as Supreme Court judges, but only for brief stints, then returned to Sydney. That, I think, is the ultimate exile: that you can suffer and die by the whim of others; that no-one need know, and there is no brake on the cruelty of the authorities should they exert themselves in that way. It is a paradox to be exposed to the vast, limitless expanse of sky and ocean, and yet feel claustrophobic. Posted in Australian history, Things that make me go "hmmmm"
Why am I reading a history of Norfolk Island? Because I’m here on a week’s holiday! But even if I were not, it’s a fascinating history. 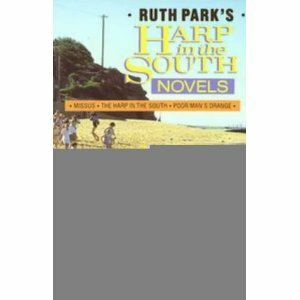 Merval Hoare, the author of this book is herself a Norfolk Island inhabitant. I am not sure whether she herself is a Pitcairn descendant, but I note that in her acknowledgements, none of the major Pitcairn families are mentioned. 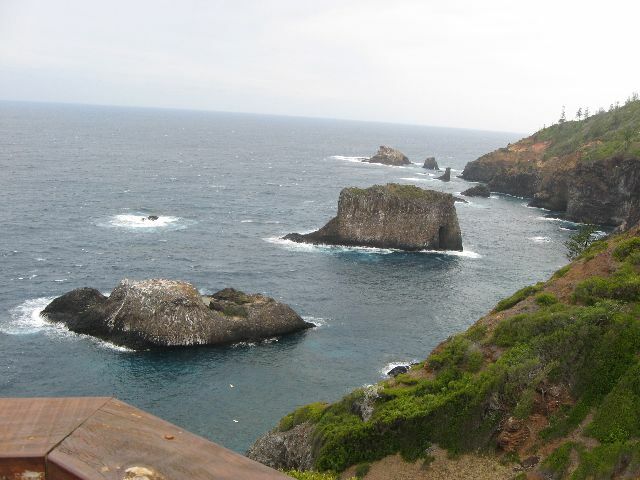 Nonetheless, having now been here, it is not hard to discern the sensitivities and allegiances that arise in portraying Norfolk Island’s history. There are surely not many places on earth where a local history can be divided up so neatly into self-contained epochs, with virtually no strands between each era. 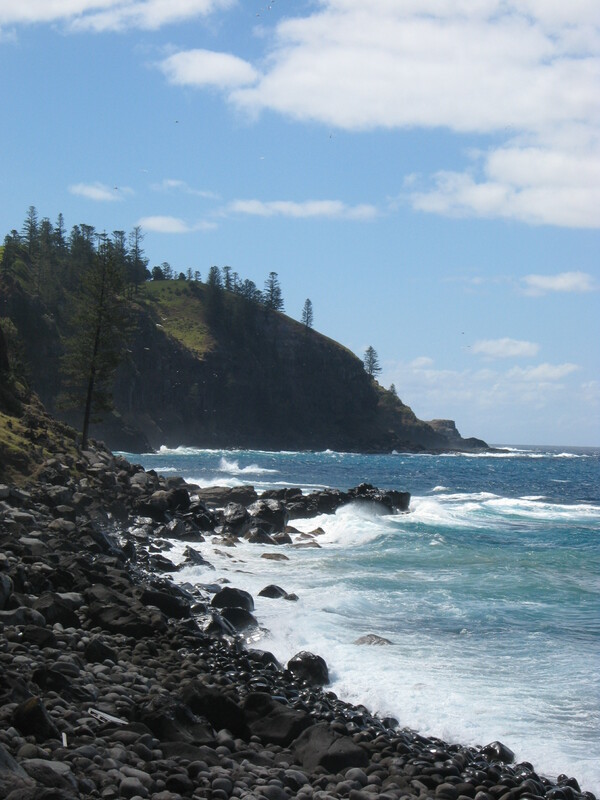 Norfolk Island was uninhabited until the Polynesian diaspora around 1100 until approximately 1400. Interestingly, Hoare’s book does not address this phase at all, beginning its narrative with Captain Cook’s discover y in 1774. For some reason, the Polynesians left and the island again fell silent. 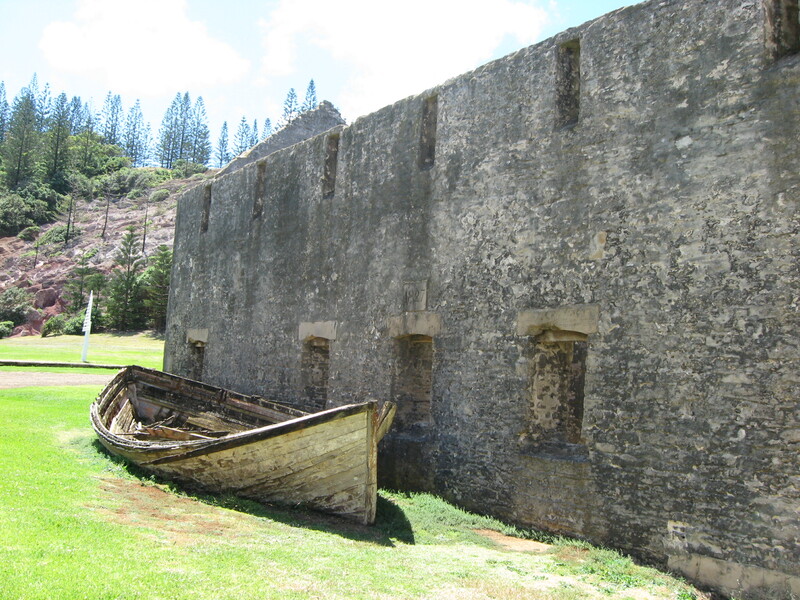 What is known locally as the “first settlement” commenced in 1788, just 6 weeks after the British arrival at Port Jackson, when Norfolk Island was established as a parallel settlement to forestall French occupation, provide pine spars and flax sails for shipping, and furnish an alternative food source for the struggling Port Jackson settlement. Once Sydney (as it was by then known) had overcome its early food shortages and the Napoleonic Wars were drawing to a close (although, I note, only just!) 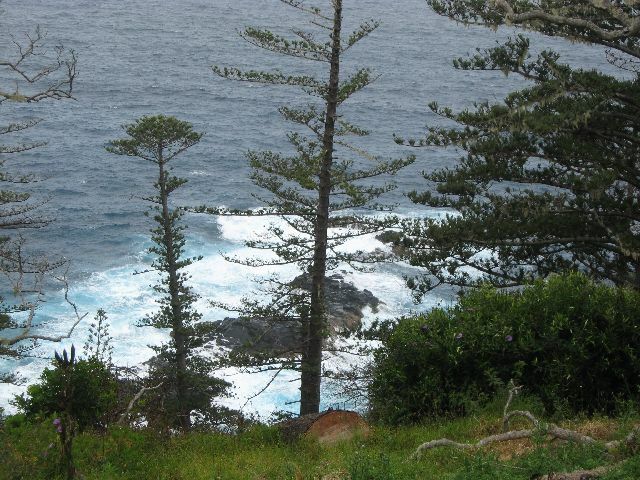 it was no longer expedient to keep Norfolk Island as a parallel colony, and it was closed in 1814 and its settlers and convicts sent, in some cases very reluctantly, to Van Diemen’s land. The buildings were torched and the island left silent again, except for the barking of the dogs and the snuffling of the pigs left on the island. The island remained uninhabited until , under the influence of new practices in prison administration, the “second settlement” began as a fully-fledged penitentiary. It was run as a place of secondary punishment: there were no women, brutality was widespread, and the island as a whole ran as a prison. Except for a brief respite under Alexander Maconochie, there was a succession of prison commandants of varying degrees of cruelty and despotism. With the uneasiness over transportation from the 1840s on, and the anxiety and repugnance over the inevitable and widespread homosexuality, the decision was made to close the second settlement in 1856. A few men were left as caretakers, but again the island fell silent, awaiting its next tranche of inhabitants. They arrived soon after. They were the descendants of the Bounty mutineers who had outgrown the small Pitcairn Island that had been their home since 1790. In the first decade, the mutineers and their Tahitian companions had fallen out with each other and after a succession of murders, there was only one original Bounty mutineer left- John Adams. He descended into alcoholism, but one night had a vision and converted to Christianity. 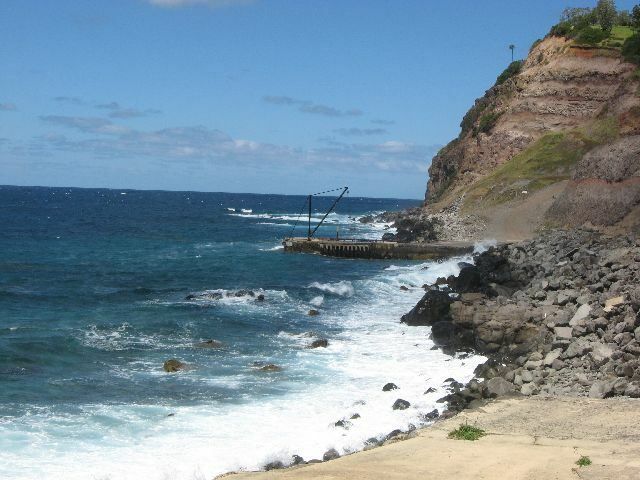 He became a devout student of the Bible and the Book of Common Prayer, and his example extended throughout the Pitcairn Islanders who were transformed into a pious, God-fearing community. 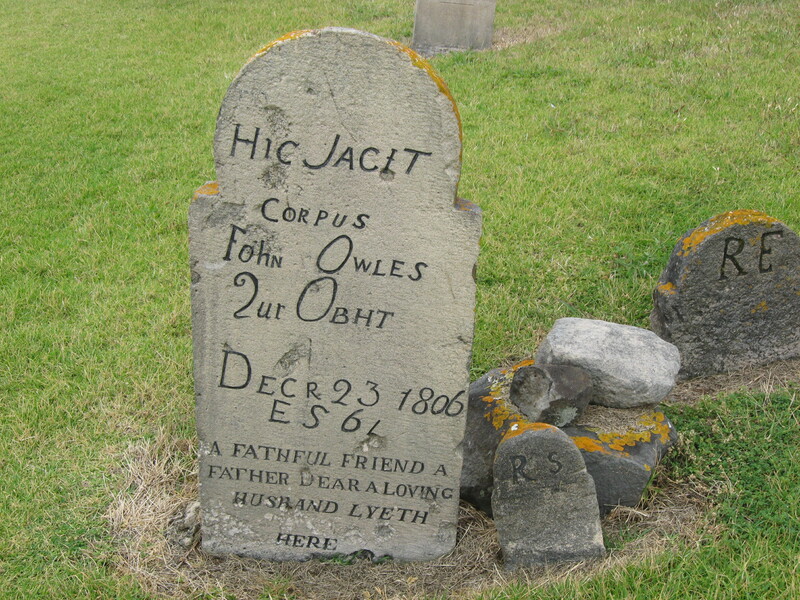 They brought their faith with them when they shifted as a group to Norfolk Island, although some returned to Pitcairn. 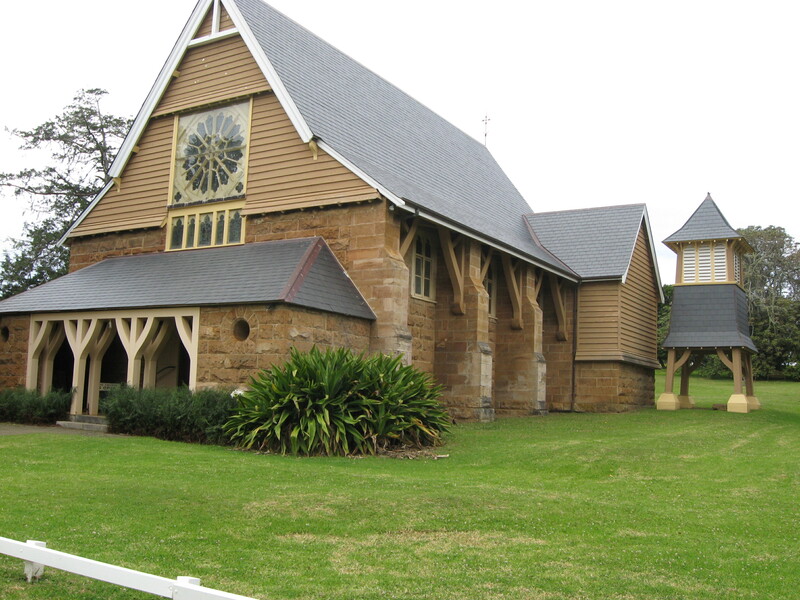 The community on Norfolk Island today has at its core the descendants of this “third settlement”. Over half of this book is devoted to the third settlement, which is after all, the longest phase of white settlement on the island. 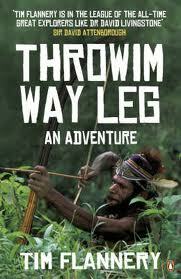 At times I found myself wishing that the author would draw breath and move away from the narrative a little. 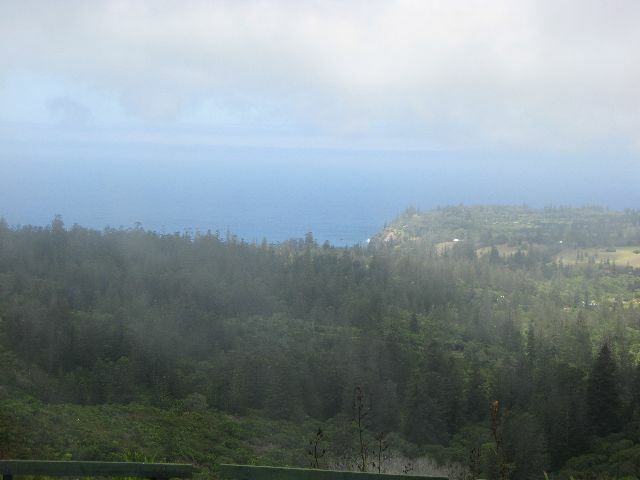 For example- how did Norfolk Island intersect with the passing Pacific traffic? 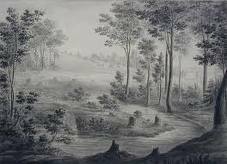 What was the nature of the contact between Sydney and Norfolk Island in the first and second settlements? There are obviously sensitivities that she is tip-toeing around: the eviction of the Pitcairn/Norfolk Islanders from the abandoned Crown buildings at Kingston; the reports about homosexuality that expedited the closure of the second settlement. At one stage the author herself slips modestly onto centre stage- good heavens! I would have made much more of this! 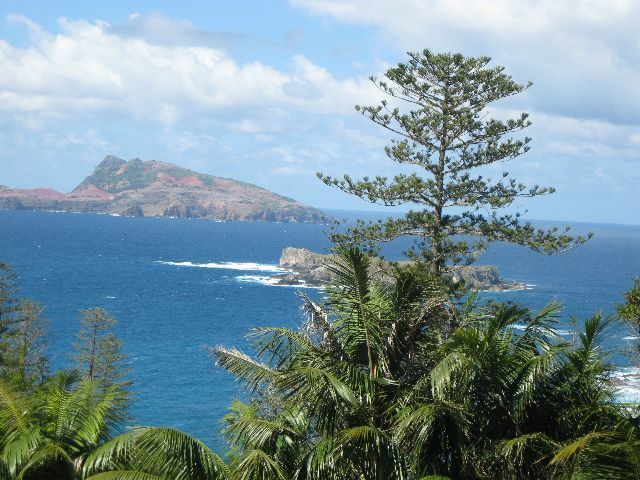 For many years there had been debate over the content of a missing document which the Norfolk Islanders claimed had transferred ownership of the island to them. The document had disappeared very quickly considering its putative significance, but the author herself re-discovered it amongst the papers of Bishop George Selwyn, deposited at the Auckland Institute and Museum. What an intake of breath and internal whoop of joy that must have occasioned!! Her relative downplaying of her find is either modesty or circumspection- I don’t know which. I read the second edition of this book, which has an additional chapter added onto what had clearly been the conclusion. There has since been a third edition which has no doubt added an extra chapter again. That’s the problem with this approach- it tends to result in more farewells than Melba, or perhaps the third book of the Lord of the Rings. Nonetheless, I feel that I’ve been given a good narrative skeleton of the history of the Island, which in its displays, tourist attractions and yes, in its very community vibe, delivers its own perspective on the island’s history. …When we empower the past by returning it to itself, we empower our imagination to see ourselves. Our certainties are our greatest enemy when we approach the past. Hindsight is always blinding. We know from our living experience that our present moments- this moment- has all the possibilities of the future still in it. None of us prescribes the reality we live in. None of us controls the consequences of our actions. None of us can predict with absolute certainty anybody else’s reaction tot he simplest gesture, the clearest sign, the most definite word. But we have to cope with these ambivalences, interpreting these never- ending possibilities. Hindsight, on the other hand, reduces all possibilities in the past to one. Hindsight leaches out not all our uncertainties, but all the past’s uncertainties. Hindsight closes down our imagination. In hindsight we do not see the past as it actually was, only as it would have been if all its uncertainties were taken away. Hindsight freezes the frame of every picture of the past. Hindsight removes all the processes of living. Makes the past our puppet.